"We believe in treating our patients as if they were our own, and we believe in treating their owners as we would like to be treated ourselves"
Whilst education is a huge focus of our work, there will always also be a need for the provision of veterinary services in rural areas of The Gambia. 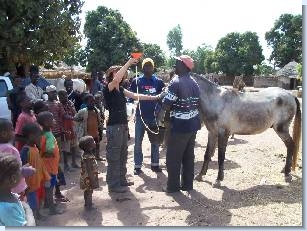 The Gambia Horse and Donkey Trust team are always busy providing veterinary services to neighbouring villages. Every week our Mobile Veterinary Clinic team travel to different villages to provide treatments to animals in need. Whilst our main focus is on working horses, donkeys and mules, our team would never turn away any animal in need of veterinary care. Once our team arrive in a village the local people bring their animals to us for health checks and treatments. Working animals are an integral part of life in rural Gambia, so their owners are keen to gain preventative health care treatments whenever possible. Trypanosomiasis (also known as Sleeping Sickness in humans) is very common in The Gambia, and is a disease that affects large numbers of working equines. 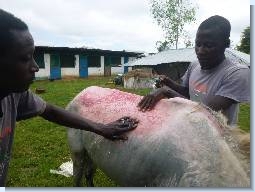 A blood parasite passed on by Tsetse flies, this disease can be fatal if left untreated but with the correct veterinary care it is easily treated. Other veterinary problems that our team commonly treat include internal parasites, wounds, burns, lameness, and colic amongst other things. Routine worming treatments are provided, and we have staff who are trained in equine dentistry and farriery so these services can also be offered to those attending our mobile veterinary clinics. 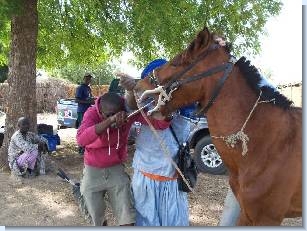 A horse receiving routine dental care at a mobile veterinary clinic. Click on image to enlarge. At the Gambia Horse and Donkey Trust centre we have the facilities to admit in-patients who require more long term treatment than we can provide at a mobile clinic. At our centre the in-patients can receive round the clock care from our trained staff. Our team have nursed back to health patients with some extremely serious and life threatening illnesses and injuries, including equines with serious burn injuries, broken legs, severe fungal infections, laceration wounds and emaciation. The centre also houses orphan foals who are hand reared by our dedicated team of staff and volunteers until they are old enough to return to the families who own them. Our team of staff and volunteers are always on 24 hour standby for any veterinary emergencies that they may be needed to assist with. 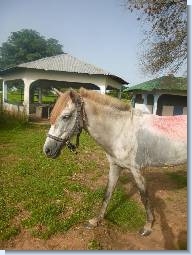 If the Gambia Horse and Donkey Trust receives a call about an animal in need of emergency medical attention at any time of the day or night, they will ensure that they reach the animal with veterinary treatment.